Sandy children delight! The Olin Y. Bignall Aquatic Center is back open for business. 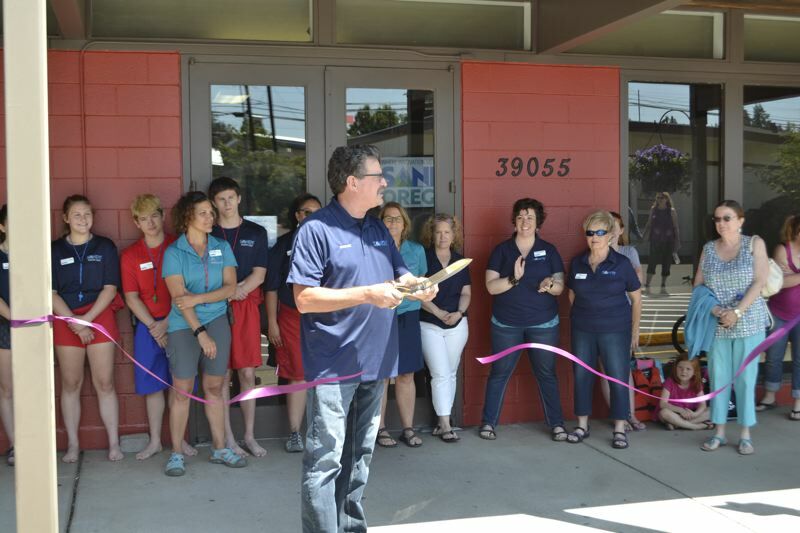 At noon Thursday, July 5, city staff led by Mayor Bill King hosted a ribbon cutting for the reopening and invited the community to a five-hour free swim. 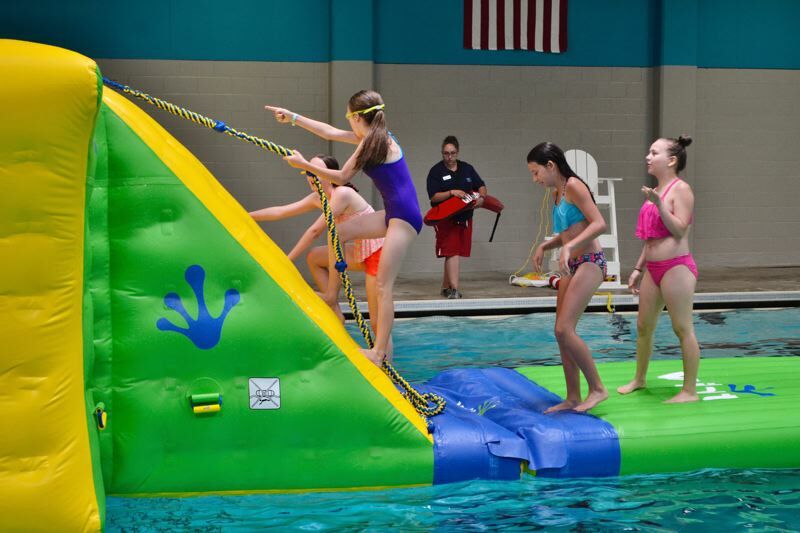 Though the diving board and slide were removed, the addition of a large inflatable obstacle course seemed to assuage the youngsters' hard feelings as they scrambled across the buoyant bounce house and jumped from the top into the water below. The center at 39055 Pleasant St., was closed for a few months after the city's official purchase of the property. The closure allowed for the city to do some needed renovations to the space for safety and efficiency purposes. Among the changes were maintenance to the HVAC system, a boiler upgrade, the installation of new computers and software and the removal of the slide and diving board because of safety concerns. "We have big things in store for the next phase scheduled to start in fall of 2019 with an estimated completion of fall 2020," Yamashita noted. "It's prioritized," Richardson said in an earlier interview. "We had a lot of people who wanted access to the pool as soon as possible. We're maintaining the current programming level. As we move forward, changes may occur due to staffing, but we want to expand our programming in the future as well." The city plans to have the pool plumbing and pumps replaced, separate the kids' pool from the main pool's plumbing so it can be warmer and more sanitary. The shell of the building, locker rooms, lobby and mechanical will also all be moved and replaced. Normal programming, including classes and regularly scheduled swims began on July 9. Richardson said there has been "a very slight" cost increase for admission, but the city has worked to create a fee structure that allows Sandy residents to pay less than their non-resident counterparts. The pool is just one part of the greater proposed Sandy Community Campus. The city plans to seek community input on the proposed project soon. During the Sandy Mountain Festival, Yamashita and Richardson will have an information booth set up behind City Hall, 39250 Pioneer Blvd., from 4-8 p.m. Friday, July 13, and from 10 a.m. to 2 p.m. Saturday, July 14. They also will have a booth at the Sandy Music Fair and Feast in Centennial Plaza, 39295 Pioneer Blvd., from 11 a.m. to 1:30 p.m. Sunday, July 15.